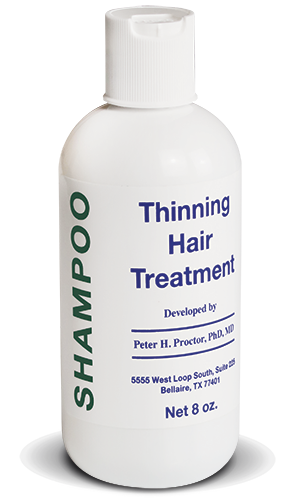 Thinning Hair treatment Shampoo can be used on a purely preventive basis or when the first signs of hair loss appear. This shampoo contains hair growth's most powerful natural enhancer, known as NANO (3-carboxylic acid pyridine-N-oxide) or "natural Minoxidil". It is perfectly adapted for when you start to lose your hair or when alopecia remains moderate. The Advanced Thinning Hair Treatment lotion also contains a high dosage of NANO, combined with natural hair growth enhancers ("EDRF"), sophisticated enzymes (Superoxide dismutases) and other antioxidants. This natural product is the most powerful one can currently buy without a prescription and is used synergistically with the shampoo. Shampoo: water, PEG, sorbitan laurate, cocamidopropyl betaine, sodium laureth sulphate, PEG-150, disodium cocoamphodiacetate, NaCl, PEG-150 distearate, sodium laureth-13 carboxylate, panthenol, 3 carboxylicacidpyridine N-oxide (NANO), allantoin, arginine, superoxide dismutase (copper peptide), fragrance.